Dianne Otto is Francine V McNiff Chair in Human Rights Law, Her research interests include the exclusionary effects of legal representations of marginalised groups in international human rights law, gender and sexuality issues in human rights and development, economic, social and cultural rights, international human rights nongovernmental organisations, international peace and security issues, people's tribunals and the domestic implementation of international legal obligations. Dianne teaches in the LLM and JD programs and supervises doctoral students in related areas of Public International Law and Human Rights Law. 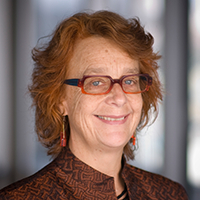 Dianne's scholarly research in the field of public international law and human rights law enjoys a national and international reputation, marked by its emphasis on melding theory with transformative practice. Dianne's scholarship explores how international legal discourse reinforces hierarchies of nation, race, gender and sexuality, and aims to understand how the reproduction of such legal knowledge can be resisted. Her work draws upon a range of critical legal theories particularly those influenced by feminism, postcolonialism and queer theory. Her recent publications include three edited volumes, Gender Issues and Human Rights (Edward Elgar Publishing, Human Rights Law Series, 2013), a chapter in Margaret Davies and Vanessa Munro (eds), A Research Companion to Feminist Legal Theory (Ashgate Companion Series, 2013) and an article in Jindal Global Law Review (2013). She also authored a bibliographic chapter, 'Feminist Approaches', in Oxford Bibliographies Online: International Law, ed. Tony Carty (New York: Oxford University Press, 2012). Dianne has held visiting positions at Columbia University, the School of Oriental and African Studies, New York University and the University of British Columbia. In 2004 she was the Kate Stoneman Endowed Visiting Professor in Law and Democracy, at Albany Law School in New York. She taught in the Oxford-George Washington University International Human Rights Law Summer School Programme at Oxford University in July 2012. She sits on the Advisory Boards of International Human Rights Law Review, Third World Legal Studies, The London Review of International Law, Melbourne Journal of International Law, The Third World and International Law and Australian Yearbook of International Law. She has also been active in a number of human rights NGOs including Women's Rights Action Network Australia (WRANA), Women's Economic Equality Project (WEEP) Canada, International Women's Rights Action Watch Asia Pacific (IWRAW-AP) Malaysia, and International Women's Tribune Centre (IWTC) New York. Through her NGO involvement, she helped draft a General Comment on women's equality for the Committee on Economic, Social and Cultural Rights and a General Recommendation on treaty obligations for the Committee on the Elimination of Discrimination Against Women, and was a member of the Expert Panel at the Asia-Pacific Regional Women's Hearing on Gender-Based Violence in Conflict held in Phnom Penh in 2012.